Creatures thought to be extinct have been spotted in the wild. Dear EarthTalk: Whatever became of the rediscovered Ivory-Billed Woodpecker that we thought we had lost to extinction? What other animals that we thought went extinct have “come back” from the dead? Whether the Ivory-Billed Woodpecker is extinct in the Southeastern U.S. is still a matter of debate. The last conclusive evidence of the bird’s existence in the U.S. dates to 1944; most biologists presume the species didn’t survive around here much longer than that. And the last confirmed sighting of the species anywhere was in Cuba in 1986. But then in April 2004, amateur birder David Luneau captured video of what he claimed to be an Ivory-Billed Woodpecker making its rounds in Arkansas' Cache River National Wildlife Refuge, sparking international interest in the story of the bird that came back from the dead. 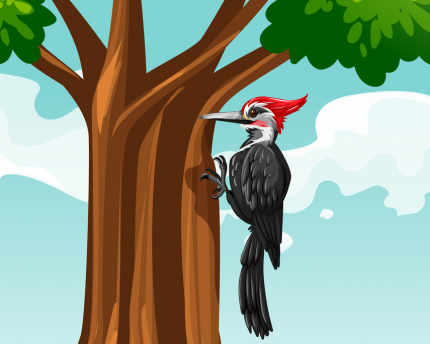 Doubters point out that the bird Luneau saw may have been a common Pileated Woodpecker, givien the similar size and coloring of the two different birds. Luneau’s shaky, distant video is far from conclusive proof, and since then no one else has managed a confirmed sighting of the bird at Cache River or anywhere else in the woodpecker’s traditional range. A 2016 trip to Cuba by researchers from Cornell’s Lab of Ornithology looking for evidence of living Ivory-Billed Woodpeckers there turned up nothing. While birders continue to hope the majestic woodpecker appears again, no one is holding their breath. One source of optimism for the Ivory-Billed’s return continues to be other examples of wildlife coming back from the dead. Some of the most famous “Lazarus taxon” species—the name refers to the biblical Gospel of John, in which Jesus raises his follower Lazarus from the dead—include the Coelacanth, a prehistoric fish that was thought to have gone extinct with the dinosaurs 65 million years ago but started showing up in fishermen’s hauls in the late 1930s; the Lord Howe Island Stick Insect, believed to have been driven to extinction on the remote Australian island by invasive rats in the 1930s only to reappear in the 1960s; and the Terror Skink of New Caledonia, presumed extinct by the 1990s but then rediscovered in 2003. Likewise, New Zealand’s Takahē, a large flightless bird, was thought to be extinct as a result of predation by introduced rats, cats and pigs at the end of the 20th century. But in 1948 a small population of living Takahēs was discovered near an isolated lake in a remote mountainous region. These days a population of more than 200 of the birds is holding steady in New Zealand’s Fiordland National Park. Other Lazarus taxon examples include Cuba’s Solenodon, the Bermuda Petrel, the Laotian Rock Rat, the Canary Islands’ La Palma Giant Lizard, Japan’s Black Kokanee, Columbia’s Painted Frog, the Bavarian Pine Vole of Europe’s Alps and Indonesia’s Banggai Crow. Of course, the term Lazarus taxon isn’t reserved just for fauna: The Mount Diablo Buckwheat, an inconspicuous little pink flower last seen in the 1930s on the slopes of the San Francisco Bay Area’s highest peak, reappeared in 2005, much to the delight of botanists.